ng>Solar cooling could be an effective way to increase the annual solar fraction of domestic hot water production and prevent the solar system from overheating in summer. Under the aegis of the IEA Solar Heating & Cooling Programme, researchers from Task 53, New Generation Solar Cooling & Heating Systems, have written a new book, titled The Solar Cooling Design Guide: Case Studies of Successful Solar Air Conditioning Design. 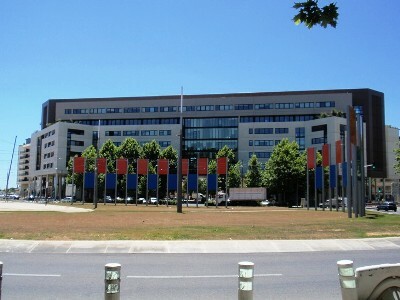 It includes a detailed case study of two buildings containing offices and flats in Montpellier, France. 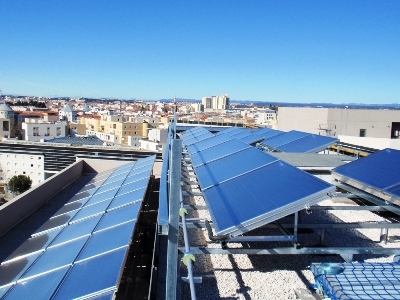 The on-site 240 m² flat plate collector system powers a 35-kW absorption chiller to achieve a 70 % solar fraction in annual hot water production (see photo). Between November and March, the system continues to provide around 40 % of the heating energy to meet hot water demand.